So excited to share my conversation with Rob Goodman from Making Ways, a weekly podcast exploring the unexpected paths to creative careers. This interview is in collaboration with Root Division, a visual arts non-profit that connects creativity and community through a dynamic ecosystem of arts education, exhibitions, and studios. I was a studio artist and a teaching fellow there for two and a half years. Hear all about my journey so far to life as an artist. Listen to the full episode on Making Ways' website, or tune in on iTunes, Spotify, or SoundCloud. "Designed in collaboration with Electric Works, Root Division presents a limited-edition box set of prints featuring 15 works by Root Division Alumni from around the globe. Each set in the edition of 50 will feature 15 11x14 in. 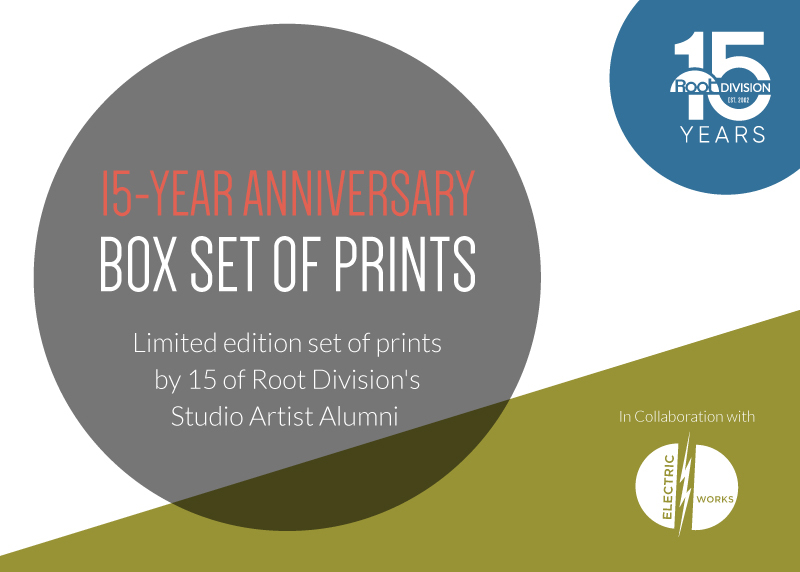 prints including photography, silkscreen, letterpress, and digital prints inside a specialty archival box -- a Root Division collector’s dream! Printed by Electric Works, Forthrite Printing, and Western Editions." 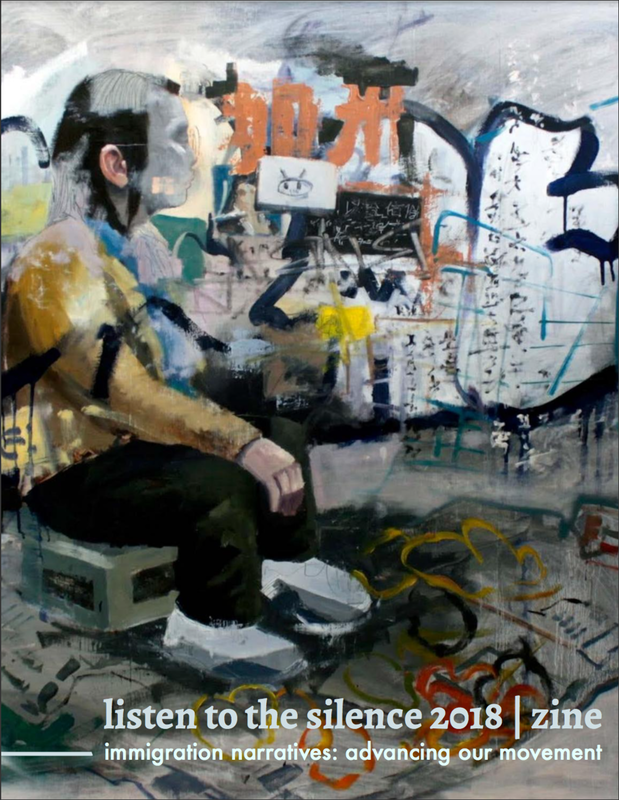 My piece "Imahe" got published on Listen to the Silence 2018 Immigration Narratives: Advancing Our Movement, an inaugural zine by Stanford University's Asian American Student Association, sponsored by Stanford Arts. Visit this link for more information. Cover art credit: Justin Pastores, "Fruits of Labor"
I'm honored to be this year's Kearny Street Workshop's APAture Visual Arts Featured Artist. Interview with Kubo: The Pinay Millenial Artist Challenging Stereotypes and Gender Roles, October 24, 2017. TV interview segment with NBC Bay Area: Rea Lynn de Guzman on Asian Pacific America with Robert Handa, October 8, 2017. Interview with hella pinay: #PINAYCRUSH: INTERDISCIPLINARY ARTIST REA LYNN DE GUZMAN, September 29, 2017. Interview and feature with the San Francisco Chronicle/SFGATE and The San Francisco Examiner. September 28-29, 2017. “Dismantling Stereotypes About Asian-American Identity Through Art,” Huffington Post Arts & Culture, April 20, 2017. “An Expanded Approach to Asian-Americannes at Vessel Gallery,” KQED Arts, republished by Juxtapoz Magazine, April 13, 2017. As my 2-year studio residency was coming to an end at Root Division, I was offered Root Division's first ever Filipina Teaching Artist Fellowship (in partnership with the Filipino Education Center). I had a fantastic time teaching art to 2nd & 3rd grade Galing Bata Students at the Bessie Carmichael Elementary School (shoutout to my wonderful TA's Nick Maltagliati, Kelley O'Leary, & Mary Finlayson). Here are some highlights of our art activities, field trips to Root Division, and our art show featuring the kids' work at New Growth 2017: EmPOWERing Peace, Justice & Love. Check out this article by Samantha Reynolds, "New Growth & Teaching Artist Fellows in the Frank-Ratchye Project Space," Root Division Talk, May 17, 2017. Read the full article here: “TL Dreams - Exhibition and Artist Lecture,” Emergent Art Space. March 16, 2017. Read the full article here: "New to America, Raised in the Tenderloin," KQED Arts, published January 13, 2017. I was featured for a cover story by Asian Journal Magazine. See the full article here: "Fil-Am artist Rea Lynn de Guzman: reconnecting with her heritage and history through art," published January 18, 2017. I was interviewed by Paola Loomis from Emergent Art Space during my Two-Person Exhibition Cut From the Same Cloth at Root Division. Read the full interview here: “Interview: Rea Lynn de Guzman,” published August 22, 2016. Our international group show Translations (curated by Emergent Art Space) got reviewed by The Telegraph India. See the article here: “Found in translation,” published March 12, 2016. When Root Division moved to its current new building in the Soma neighborhood, I proposed the Filipino Education Center at Bessie Carmichael Elementary to be a new site partner for Root Division's Youth Education Program. As a result, I taught art to K - 1st grade students during the Fall and Spring semesters at Bessie Carmichael Elementary, along with my wonderful TA's Stephanie Wu & Eda Li. Here are some of our art activities and final projects at Root Division's New Growth 2016: Celebrating our Community. I joined Kearny Street Workshop's General Planning Committee and co-curated the Visual Arts Show for APAture 2015: Future Tense at Arc Gallery. Check out the exhibit photos I took. In December 2014, I joined Root Division as a studio artist. Through Root Division's Youth Education Program, I taught art to K - 4th grade students during the Spring and Summer sessions at Cesar Chavez Elementary. Here are some of our art activities and projects. My mentee Laura's final project at the Analog Digital group show at Southern Exposure. Youth artists paired with professional artists in their medium of interest convene together each week at Southern Exposure, splitting into pairs and rejoining to collaborate as a group throughout the year. The mentees learn new skills, develop projects with their mentors, participate in group critiques and share their experiences. This year, mentors and mentees collaboratively explore the differences between digital and analog technology – and the impact such technologies have on their daily lives. Working in painting and drawing, photography, sculpture, video, body painting and other media, this interdisciplinary group show presents the work of the accomplished artists from Southern Exposure’s year-long program. My sculpture After Maria Clara's Piña Fiber Sleeve was featured at ARTslant's The Views and awarded the Mixed Media Showcase Juried Winner.